The Defiance factory produces cylinder blocks, cylinder heads and crankshafts for some of GM's V-6 and V-8 engines. 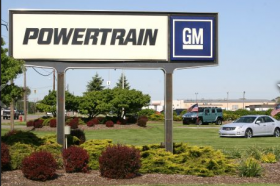 Federal authorities are investigating the death of a General Motors worker at its Defiance, Ohio, casting operations plant this week. Electrician Terry Bodenbender, 50, died Tuesday around 1 p.m. from injuries he received after falling between 25 and 30 feet into a pit, authorities said. Bodenbender was working on a crane above the pit when he fell. The U.S. Occupational Safety and Health Administration is investigating Bodenbender’s death. The investigation might take up to six months to complete, said Chad Positano, OSHA assistant area director in Toledo, Ohio. OSHA will gather evidence and interview employees as part of the investigation, which could lead to citations or penalties if violations are found. The Defiance factory, which produces cylinder blocks, cylinder heads and crankshafts for some of GM’s V-6 and V-8 engines, was last inspected in June, when OSHA found two minor violations for housekeeping and “respiratory protection” issues. Westrick said Bodenbender was working alone when he fell into a pit below him that stores coke. The sheriff said it took hours to recover Bodenbender’s body. “It’s not meant for humans to go down there,” he said. GM confirmed the death in a statement. A spokesman declined to comment further, citing the ongoing investigation. The Toledo Blade newspaper reported the fatality on Wednesday.